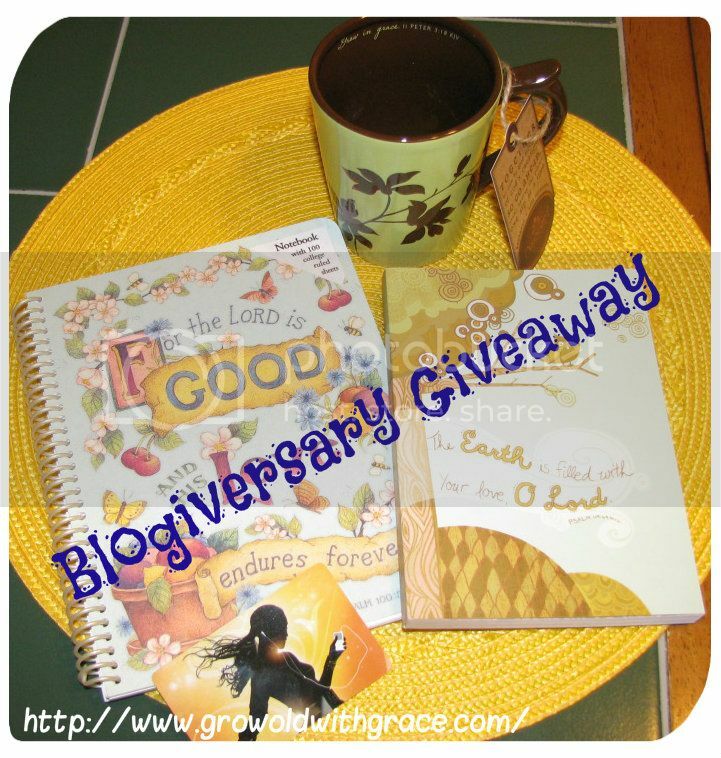 Grow Old with Grace: New Giveaway ~ Blogiversary Celebration! Holy Cow! I just can't believe next week will be my one year blogiversary for Grace's blog! How does time go by so quickly? It has been so exciting to meet all of you along the way, to go in search of topics to entertain or educate you or just to let you know what's going on in our lives. I have shared good times and not-so-good and you have been such sweet friends that I can't thank you enough. So, in celebration, I am hosting a Giveaway for you! Enjoy and thank you again for visiting, commenting, assisting, praying, and so much more during the past year. You mean the world to me! Wow, a year sure flies by. I've been reading a while now and enjoy. Congrats on a year of following. Thanks for dealing with a subject we all face but don't talk about too much, and there are limited resources out there. We tend to get hidden quite a bit, and messed around with by the government (SS, Medicare etc). Hope the next year is even better! Congrats! Wow! A year??!! You are a great "Blogger"! CONGRATULATIONS TO YOU! Grace, Thank you sooooo very much! I am sorry it has taken me so long (almost a month) to respond. As you know, during the time I won your wonderful gift I had rotator surgery on my right shoulder. Unfortunately, I am right handed & am just now starting to feel comfortable typing on my laptop, Your gift could not have come at a better time!!! The day after my surgery. My husband opened it for me & for that moment it made the pain go away. I love the cup & the 2 spiritual notebooks. I am anxious to use my $25 iTunes card too!! Wow, what a nice gift box. It is not often that I win something. Thank you, Thank you, Thank you! You are so welcome, Marje! I am happy to hear it perked up your day! It was fun picking things to create this giveaway...so fun I may just do it again before too long!